The World Trade Center of Delaware and the University and Whist Club have entered into a unique, Affiliate relationship. The University and Whist Club is a private, city-dining club housed in the historic 200 year old, Tilton Mansion in Wilmington, Delaware. This new relationship allows Members of the WTCDE to join the University and Whist Club at a substantial 50% discount; entering under the Non-Profit Membership level of $1,375*/pp a year. If you are an out-of-market (60 miles or more from the club) or an out-of-country visiting Member or Guest of the WTCDE, you may gain access to the University and Whist Club for lunch, dinner and or meetings under the main WTCDE Membership**. The Whist looks forward to being your home away from home and offering you and your clients a superior culinary experience. So, if you are visiting Wilmington from another country and need a temporary place for entertaining clients or vendors, this arrangement between the WTCDE and the UWC affords you access to The Whist, with prior reservations required. The 13 meeting rooms and event spaces are available to UWC Members at no cost. If you are holding a sales training session for 50 or a more private meeting for 4, The Whist offers state-of-the-art audio visual, including live streaming, for all of your meeting needs. For Meeting/Dining reservations, please call Margaret Reilly at (302) 658-5125 ext. 103, for additional Membership information (302) 658-5125 ext. 102. *With a one-time initiation fee of $750 due at time of application submission, and a $900/annual Food & Beverage minimum. **Dining and meetings require prior reservations and payment at the time of service rendered, only. Coffee and Chocolate from Haiti’s Best Coffee, INc.
Haiti’s Best Coffee, Inc. offers one of the premium coffees of the world. Enhanced by a long growing season in the temperate mountains of Haiti, the Caribbean weather caresses each bean to produce one of the finest coffees you can drink. This exquisite coffee is kissed by the warm Haitian sunshine, high altitudes, and cool nights. Our coffee is 100% Arabica with Ethiopian roots. Passionate growers hand-pick each bean at the peak of flavor to be packaged and exported to the United States for roasting. This ensures delivery of the freshest quality product and directly links you to the spectacular Haitian countryside with every sip. 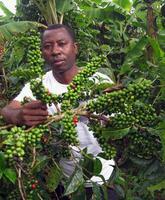 Haiti’s Best Coffee, Inc. sources its beans from small local farm co-op producers. This means we buy directly from the farmers who pick each coffee bean by hand. This “closed-circuit” relationship ensures a holistic life cycle to ensure an intimate and personal experience with our coffee. As a result of this relationship, our farmers gets paid directly with no “middleman”. We have found that this model best allow him to spend locally and thus promote the local economy and true regional economic development. Haiti’s Best Coffee, Inc. works with small producers across Haiti. By cutting out the middleman, we allow our growers to spend locally and thus promote the local economy and true regional economic development. We exceed fair trade prices for crops and a portion of proceeds from sales are returned back to farmer communities in the form of agricultural, small business management, and entrepreneurial development activities. Luscious, chocolates from our friends at Singing Rooster. Haitian chocolate is rare and offers tasting notes of Red Fruit, Hazelnut, Jasmine, Licorice, and White Pepper. Singing Rooster's farm-to-table chocolate empowers rural families with social and environmental responsibility: paying BETTER than fair trade, improving then adding value to crops, reforesting w/ income-providing trees, opening access to markets. With a storied elegance and tradition befitting one of the most prestigious hotels in the world, the Hotel du Pont stands as a magnificent bridge between Wilmington, Delaware's rich past and cosmopolitan present. Since welcoming its first guests in 1913, the hotel has remained a Gilded Age icon, a monument to a time when artistry, grace and sophistication ruled the day and an era when travel meant something special and exciting. 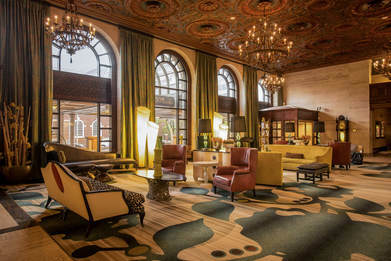 Then and now, arriving guests are greeted by accommodations and social areas framed by ornate, hand-carved wood, mosaic and terrazzo floors, and imported European chandeliers - all first created by the finest French and Italian craftsmen of their time and beautifully maintained for over 100 years. World Trade Center Delaware brings you access to market-leading foreign currency exchange services at preferred rates through the scale and power of our global network.